Home » Airports » I Love London City Airport! I flew out of London City Airport for the first time last week and loved it. It will be my new go-to airport In London. Although I don’t have any hostility against London Heathrow or Gatwick itself, I don’t fancy the long trips to reach them or the overcrowded lounges. My family lives near Tower Bridge, which is not a quick trip to either Victoria Station for the Gatwick Line or Paddington Station for the Heathrow Express. But via Uber, London City is only 15-20 minutes and about 15GBP away. I booked out of City because I needed to get to Milan early but didn’t want to take a bus or Uber to Gatwick or Heathrow. The flight itself was a tad more expensive, but the reduced stress, less time, and cheaper transit costs made it more than worthwhile. The airport is quite compact, with a central security checkpoint and then some eateries and shopping before a long corridor of gates. There are no jetbridges. There are no Priority Pass lounges. But there are some great views. After clearing security (just as annoying as LHR and LGW with the liquids), I enjoyed a cappuccino before proceeding to my gate. On my way, I stopped to take several pictures. What a cool, compact airport. Being Alitalia, the flight was of course delayed. Finally, we boarded via airstairs. Nothing to share about the flight, though I did see some interesting planes we waited to takeoff. My first experience with London City Airport was a good one. I hope to use it more often going forward. PP just needs to add one of the coffee shops or cafes as a restaurant, like at Gatwick. Inbound it’s a dream. Rarely a queue for immigration, very fast luggage delivery. Outbound the security lanes can be busy ( no Fast Track), but generally okay. Forget Uber: use the DLR, one change to Tower Gateway, save the planet. For some reason LCY is not an option for the proposed Southwest service: is that because the MAX exceeds the size restrictions? ( assuming it ever returns to service). I’m not at all opposed to public transport in London during the day, but this was 5:00 AM. My side of the family is mostly from LA. I was visiting my sister-in-law. I once visited LCY while in London but never used the airport as a passenger. I once was flying with business colleagues from London. I flew from LHR because I had to go to the west coast of the U.S. However, two colleagues had to fly to JFK. I thought they were not smart in flying LHR-JFK when they could have flown LCY-SNN-LCY. One of them lacked Global Entry and caused the other to wait for her at JFK. If they cleared at SNN, it would have been fast in addition to the use of the nice LCY. Of course, those two made another error. They had time to fly JFK-LHR on the daylight flight but chose the red eye. Did you happen to catch a glimpse of the ever-elusive BA A318? I was looking for it, but could not find it. Virgin Atlantic doesn’t fly to London City Airport. British Airways uses an Airbus A318 from Nyc Jfk Airport to London City Airport. surprised that you were able to take pictures at the tarmac. they’ve always been rather strict about not taking pictures outside the terminal building in my experience. No one said anything to me and there were plenty of guys in vests standing around. It’s a great airport – my preferred go-to for European flights by a country mile. You can also check-in up to 30 mins before your departure time, something that is not possible or permitted at any other London airport. I am not sure what takeoff direction they were using on the day you departed but one of the great experiences there is the very steep takeoffs and landings – particularly if you approach from the west over the towers of the City of London and Canary Wharf, which seem to sail by just under you before a sudden descent to the runway threshold. Just to note that Heathrow can easily be accessed from Tower Bridge too. District line to Paddington then change to Piccadilly Line (very easy, just on other side of the platform) to Heathrow. Obviously it takes much more time, but this would be far quicker than getting to Paddington then Heathrow Express. Cheaper too! @Tim: I Agree. I use the Underground when I fly into Heathrow without luggage. Virgin Atlantic does not land @ London City Airport. British Airways uses the Airbus A318 from Nyc Jfk to London City Airport. This airport reminds me a lot of Toronto’s city airport. It uses “small” and “convenient” to its advantage. 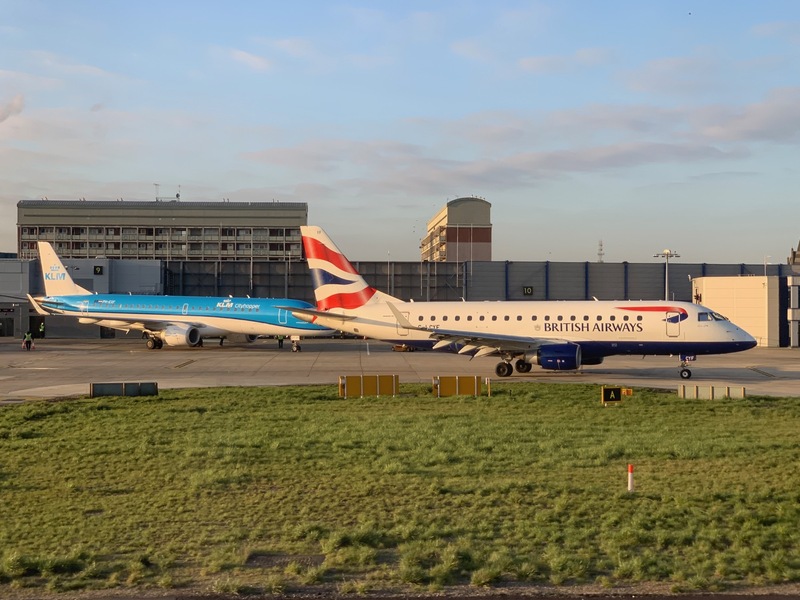 London City was selected best 2019 UK airport by Wanderlust UK magazine readers’. Have to admit I flew there once and can’t share the excitment. Found the airport too small, too crammed, with few restaurant and shopping options. And I don’t particularly appreciate these small planes, which made the “plane spotting” there boring for me. The steep landings and takeoffs are fun, but I wouldn’t advise this airport to people with a serious fear of flying. Just matters of personal opinion, obviously. I do still love LCY, but as it gets bigger and busier, it is starting to lose it’s big advantage of being small and quick to get through. There no lounges, and if you’re delayed it’s quite a boring place to be stuck as it is light on facilities, and the departure lounge gets very busy very quickly. @Kerry – despite landing at LCY many times, we always approached from the east, so only two weeks ago I had my first approach from the west. Amazing views but (and I’m not a nervous flyer) I genuinely thought we were going to hit the top of Shard.